The ultimate blend of absolute luxury, performance and styling presence. The first model Soarer (the Z1) was released in Japan in 1981 and the same basic design carried through until 1991 with the Z2. These cars were very closely related to the Supras of that era and shared many components, including engine design. 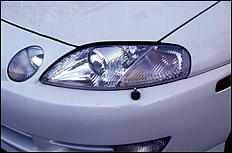 However, during this time Toyota had formed their luxury car brand, Lexus. 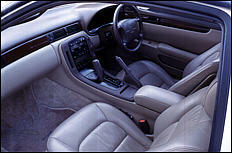 Their first flagship model was the LS400 sedan which came with a Toyota-engineered V8 powerplant. A few years later, the 2-door luxury/sports car was released. 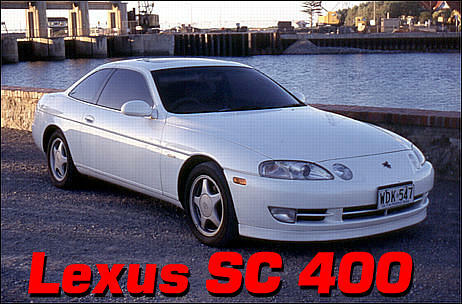 This car is known as either the Lexus SC400 or the Soarer V8. The entire floor plan is very closely related to its larger sedan predecessor. Because the Lexus was foremost intended as a luxury vehicle, the coupe has inherently refined levels of NVH (Noise Vibration and Harshness). The body design was born in California, as the car was especially styled to hook the North-American market. The design method they used is amazing; it was created using balloons and plaster mockups (no 'proper' initial drawings were ever made!). The aerodynamic efficiency of the body is good with a 0.31Cd with the optional rear spoiler (actually just a small extension). The car is 12.5cm (4.9-inches) shorter than the LS400 and is also slightly narrower and shorter in height than the 4-door sedan. The front suspension uses upper and lower A-arms with coil springs, telescopic dampers and an anti-roll bar. The independently suspended rear and uses upper A-arms, dual lower lateral links, lower semi-trailing rods, coil springs, telescopic dampers and a rear 'bar. The model we drove came with the terrific airbag suspension which replaces coils and dampers with what are effectively air cushions that can be adjusted from inside the cabin. We enjoyed immensely the faultless ride and flat cornering characteristics it provided. The top-line models also come fitted with an electronically controlled four-wheel-steer system which improves lane change stability and aids tight manoeuvring. Braking is another area where the Soarer excels - its standard ABS system acts on 11.7-inch vented discs at the front and 12.1-inch vented discs at the rear. These stopped the car with an absolute vigor. The Soarer came factory shod with 225/55 16s on 7-inch wide alloys. 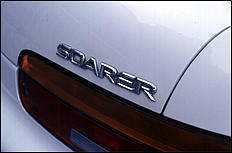 Within the cabin is where the Soarer is in a class of its own. We tested the Limited version which is top-of-the-line, but this particular one didn't come with the optional television, GPS or rear spoiler. Its inviting soft leather seats have electric operation, while the driver's seat has memory settings for easy driver changes. Operating the climate control and audio system is simple as two main controls are located to the driver's side of the console to give quick access. The audio system itself uses a 12 stack CD-cassette-tuner with front tweeters and a rear deck-mounted woofer. The sound that is delivered is far superior to any other factory system I've ever heard. The digital display dashboard is the only area that lets the interior down. It looks impressive but when you're driving along with sunlight streaming in from certain angles, the poor contrast makes reading information difficult. Certain sunglasses also impair the visibility of the display. The optional TV that comes on some models also links to a reversing camera in the rear spoiler to aid car park manoeuvring. However, visibility isn't a problem, it's just that the boot slopes away out of sight. Some of the added extras the Soarer packs are: remote front parking 'aerial' (on the optioned models), soft-touch indicator stalk, chimes for every conceivable function, power sunroof and power tilt'n'slide steering wheel for easy entrance and departure. Even the door hinges are a major piece of design. 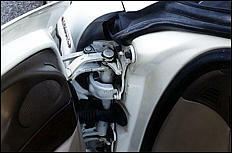 An elaborate, fully cast hinge moves in an eccentric arc when the door is opened which allows the doors to move forward out of the way of passengers. Very cushy. The all-alloy quad-cam 32-valve injected V8 motor is a flexible vibration-free powerhouse. Displacing 4 litres it uses a 10:1 compression ratio, which requires that it drink unleaded fuel with an octane rating of 91RON or higher. The engine's output is 194kW (260hp) at 5400rpm and 365Nm of torque at 4600 rpm. Never before have I driven a V8 that revved so freely; punters can approach the 6500rpm limit almost unknowingly. Its electronically-controlled 4-speed auto transmission (no manual is available with the V8) is identical to the LS400's but it does use a slightly shorter first gear to help accentuate the car's more sporty appeal. The car also comes fitted with a lower ratio differential to further improve acceleration. A Torsen LSD is fitted as standard while traction control is an option. The traction control system reduces engine torque momentarily and also applies either the left or right rear brake as required. The V8 engine is certainly a deceptively smart performer. Because the interior of the car is so well removed from engine noise and vibration, the whole acceleration experience seems less spectacular than it actually is. The big winged warrior can fly to 100km/h (62.5mph) from a standstill in the low-7 second bracket and can whisk down the quarter mile in 15.2 seconds. Getting the automatic transmission to kick-down is the key to making the 1680-odd kg (3700 pound) Soarer rapid. Cruising at a constant 80km/h, drivers can push the accelerator to the floor and wonder where the grunt is. But mash it quickly down and the engine leaps to its peak-torque revs and the car really burns along. Fuel economy is reasonable for such a well-equipped luxo V8 - 20mpg (about 12L/100km) is an average is most urban conditions while 23mpg (about 10L/100km) can be easily attained with overdrive engaged on the highway. For such a dimensionally well endowed vehicle, its handling was far better than we'd expected. With traction control switched on, very tight manoeuvres can be executed without fear of huge power oversteer. Under these urban conditions the four-wheel-steering is also invaluable. When fitted with the rear steering, the car turns in a remarkably small 11 metre (36.1 foot) circle. Higher speed stability and handling are also wonderful. The weight of the car and its magnificent suspension allow it to be held on an unshakable line through twists and gentle sweepers. Because the Soarer had to be quiet and conservative for its designated market, the dual exhaust system is there more for show than go. It uses two cat converters and a small pipe diameter, so this can be removed and replaced by a larger free-flowing twin system. The engine will also then be able to release a beautiful exhaust note - along with slightly improved fuel economy. Because of the complexity of the system, we'd say a total of around $2,000 (including cats) would see the Soarer equipped with a quality twin system capable of providing an extra 10-15% power. On the intake side, enlargement of the airbox intake and the fitment of an aftermarket filter might give another 5% power for minimal cost. In its domestic market the Soarer has a range of performance goodies available for it - including a bolt-on supercharger kit! 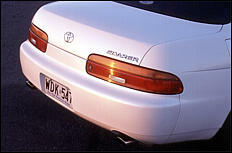 The Soarer was released late 1991 (but at different times around the world) and has only ever came to Australia as ex-Japan imports. To have one (legally) registered and on-the-road requires it to undergo full roadworthy compliance. This means only a workshop with appropriate certification can perform the labour that is needed for the car to comply with local laws. There are now many people in Australia importing and compliancing these cars (most are in Queensland) and depending on condition, options, and kilometres they can sell for between A$32,000 and A$60,000. Some companies import brand new vehicles which can cost around A$150,000 - so A$32,000 for a used one is pretty good value! Top compliance companies such as CrossOver Car Conversions in Victoria also supply a 3-year/75,000km warranty. We aren't surprised to hear the cars are absolutely problem free. The only item that is worth checking is that there is a genuine odometer reading. And whenever buying cars ex-Japan, ask to see photos of the car pre-delivered as many have been crashed in Japan and hastily repaired here. Some vehicles we have seen (not necessarily Soarers) have been burnt out or involved in a major accident. The car shares many bits and pieces with our locally-delivered Lexus 4-doors, which also means there are many mechanical parts readily available if needed, although the same can't be said for body parts. 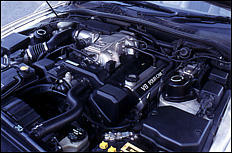 A twin-turbo 2.5 litre and 3-litre normally aspirated variants of the Soarer are also available, but the V8s are generally more common and therefore cheaper than the twin-turbo. 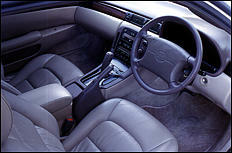 Designed foremost as a luxury car, the Soarer is a total success. Build quality is superb, trim levels are up to the standards of Euro cars and it bristles with innovation. It delivers effortless performance and is one of the most comfortable vehicles on our roads. A very refined, brisk, luxury car with a attractive price tag ex-Japan. However, insuring it could be a little bit of a problem as body parts are not freely available in Australia. But overall, a superbly sophisticated car for those who want to commute to work in a luxury, head-turning vehicle and play racing-driver on the weekend. Thanks to Clive at Japanese Motorsport (+61 8 8260 6919) for supplying the test car which is available for around A$40,000.